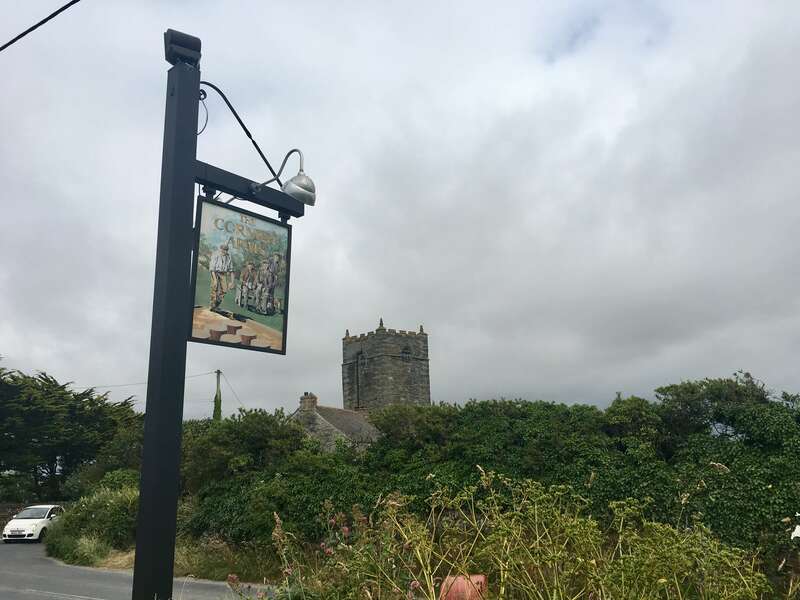 The Cornish Arms is situated in St Merryn, about 10 minutes’ walk from where we stayed on our Cornwall trip and is owned by Rick Stein. Rick Stein has lots of restaurants and food outlets in Padstow and the surrounding area and I was dying to have dinner at his Seafood restaurant but unfortunately it was booked up while we were there. Never mind, it’s a great excuse to go back! The Cornish Arms is a little more relaxed and has more of a gastro pub atmosphere than some of his fine dining venues and this suited us well. It’s a little bit countryside pub inside, although a little more light and spacious. There’s wooden furniture, exposed ceiling beams and log fires which are perfect for cosy autumn and winter visits. The staff were lovely and, although we hadn’t booked a table, we were told there would be one available in 20 minutes. It was really only about a five minute wait though before we were shown to our table and seated with our drinks. Our waiter was super friendly and was having a bit of a laugh and joke with us as we were seated. The menu changes regularly and reflects the best local produce and simple pub food. There are plenty of local ales from St Austell’s Brewery available on draft too. There’s also a specials menu which when we there had a Goan fish curry which made it a touch choice for me. 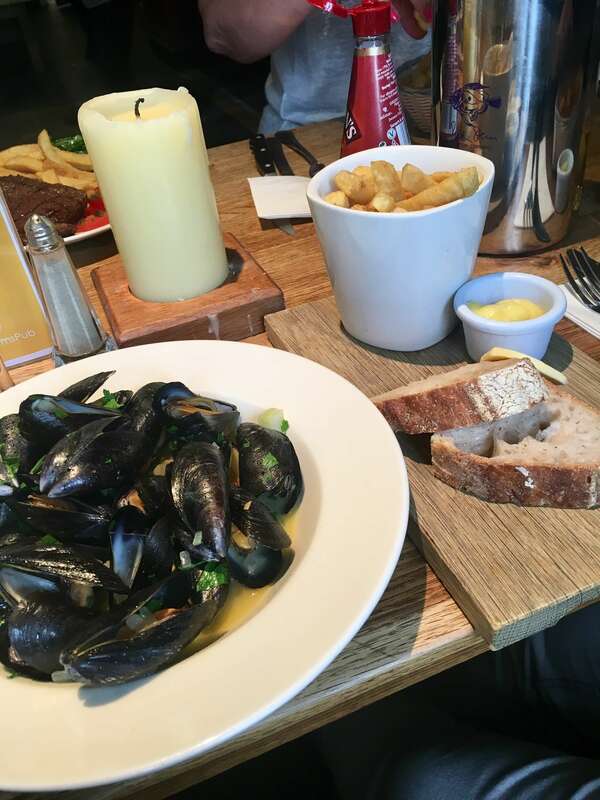 I ordered the mussels and chips (or as I know it – moules frites) which is one of my favourite dishes, especially when you’re by the sea and you know that the ingredients are fresh. It also came with crusty bread which was perfect for soaking up the delicious sauce. 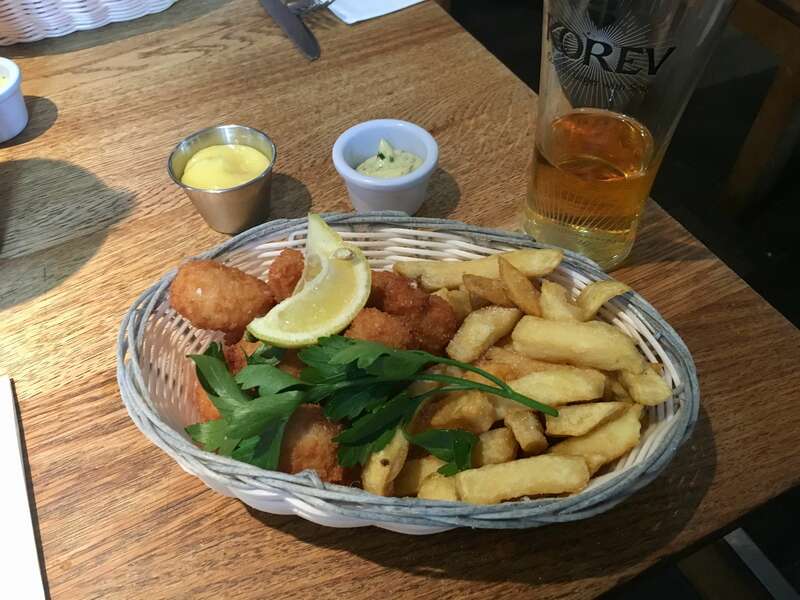 My boy also went for a seafood dish and chose scampi in a basket – a traditional pub favourite. The food was really tasty and the portions were healthy in size. We also indulged in some sticky toffee puddings with clotted cream for desert which were delightful but probably a little too much to eat after our mains! It was pretty reasonably priced – a bottle of prosecco was around £30 and main meals were about £15. We had a really great meal at The Cornish Arms and I’d definitely recommend it for mid-range dining. I’ve also found out from their website that they are dog-friendly so it could definitely be one to take Alfie to when we visit Cornwall with him next. 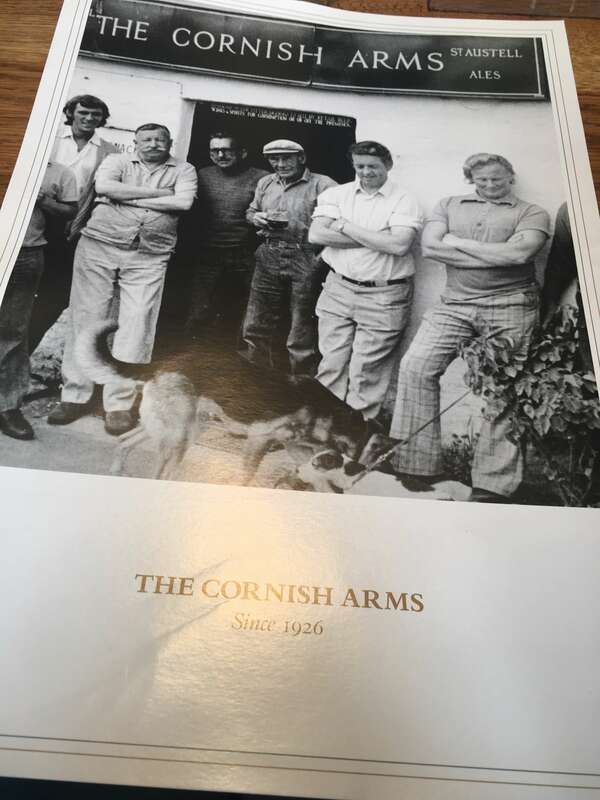 Find out more about The Cornish Arms here. Oh you definitely should – delicious food and very reasonably priced!